On the 19th of November 1995 the interior of the Wem Town Hall was completely destroyed by fire. The structure was rebuilt through lottery funding and now serves as a community arts centre. Twenty years almost to the day, Linda and I have a Sunny Side Art exhibition in the Town Hall Gallery. 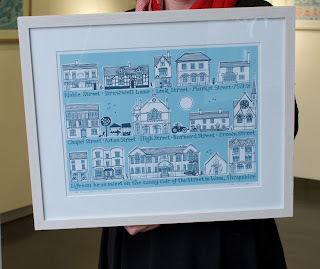 Emma Powell, assistant entertainment and marketing manager for the Town Hall saw the potential of exhibiting Sunny Side Arts prints, ceramic and textiles in the ground floor gallery and contacted us. A couple of weeks prior to the exhibition, we explored Wem and found many interesting buildings along and nestled behind High Street. We discovered that the unusual name Wem comes from the Saxon word Wamm, meaning a marshy place. 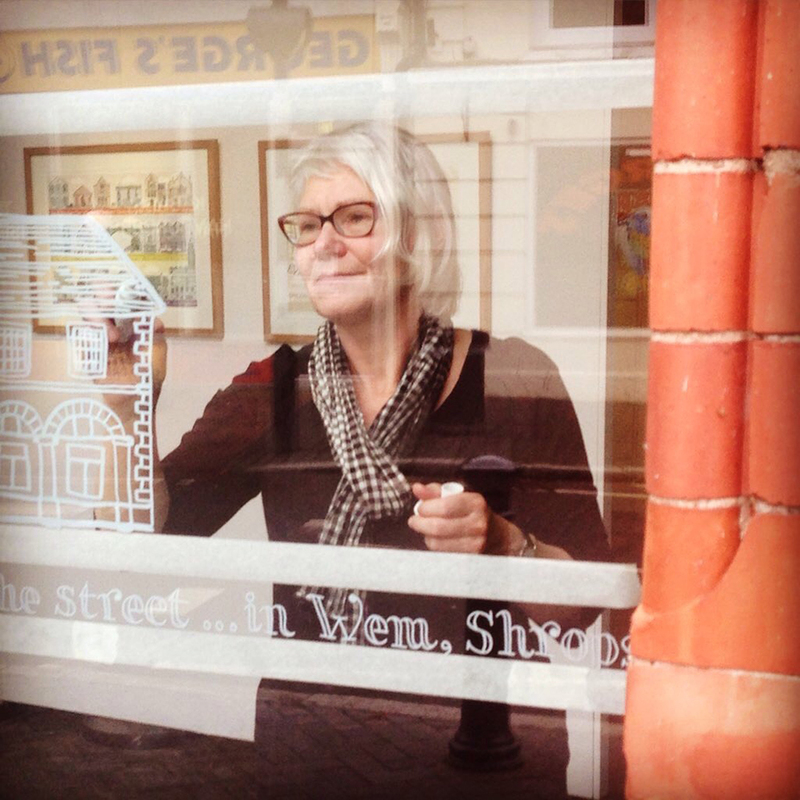 Linda began to sketch her way around the town and on returning to Shrewsbury, promptly designed a Sunny Side of the Street illustration of Wem which features in the exhibition. One of the most fascinating and enjoyable requirements for the illustrations is researching the places Linda features in her designs. The buildings and people all have stories to tell and it's tapping into these that inspires us. 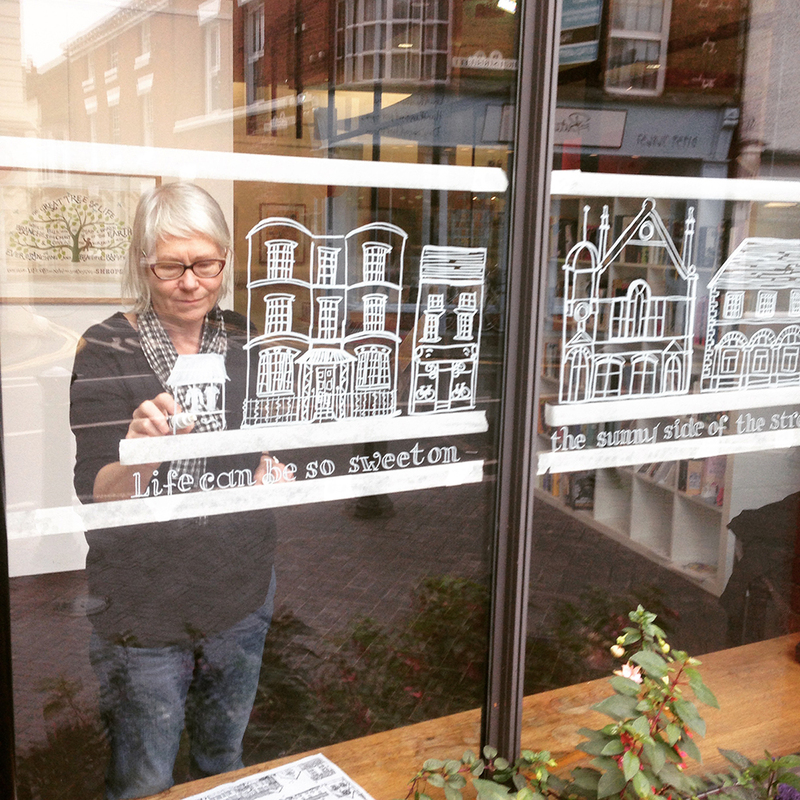 "Painting on the window is tricky because everything has to be reversed! 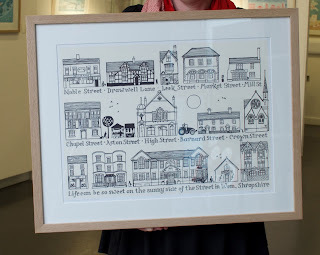 I used a template for the writing but the buildings were drawn freehand. Just take a deep breath and go for it!" On opening night, Emma (a true Wem Gem) on behalf of the trustees of the Town Hall provided refreshments. 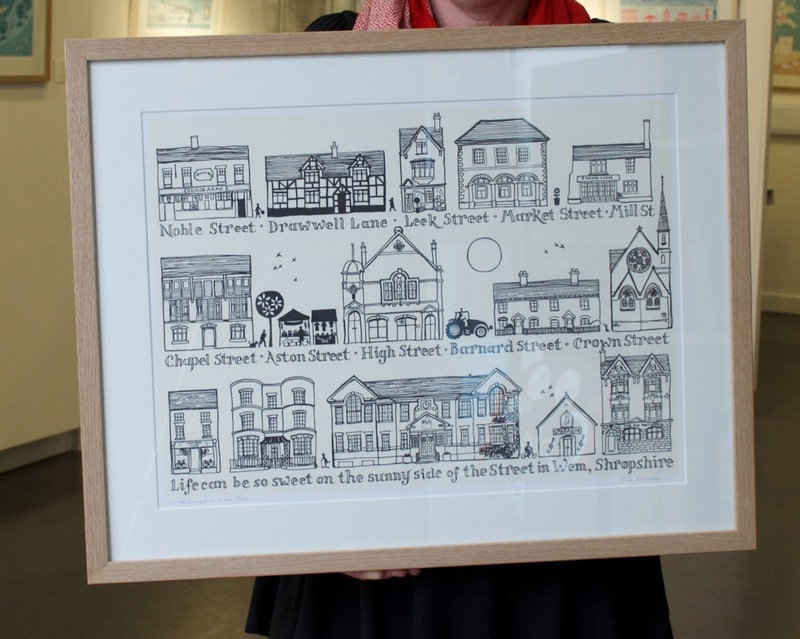 Our first sale was a framed print - the Wem drawing.....nice. The exhibition will continue until 21st December. come along and discover Wem's secrets for yourself.